Wanting to go out to eat but also wanting to stick to your organic and natural lifestyle? Have no fear- I’ve put together a cheat sheet below of casual dining options that offer some yummy and natural options. 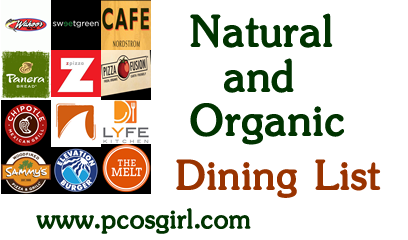 I haven’t found a 100% organic dining place but in a pinch the list below will do! Chipotle (Mexican cuisine) ingredients include: organic beans, organic avocado, natural meats, and organic cilantro. Elevation Burger (American cuisine) ingredients include: organic beef, organic chicken, organic bacon, organic veggies and grains. LYFE Kitchen (Mixed menu) ingredients include: grass fed beef, local produce, raw kale smoothies and vegan fare. Nordstrom Cafe Bistro (American cuisine) ingredients include: Organic greens, wild caught fish and shrimp, natural turkey, and organic berries. Panera Bread (American cuisine) ingredients include: antibiotic free chicken and turkey, organic oats, organic yogurt, and spinach infused smoothies. Pizza Fusion (Italian cuisine) ingredients include: organic wheat crusts, hormone free meats, all natural chicken wings and organic drinks. Sammy’s Woodfired Pizza (Italian cuisine) ingredients include: organic salads, all natural pepperoni, and a list of the farms supplying the organic or natural fare on each menu. Sharky’s Woodfired Mexican Grill (Mexican cuisine) ingredients include: organic salads, wild caught fish, all natural chicken and steak, organic beans and rice, organic yams and rBGH free cheese. Sweetgreen (Pesco-Vegetarian Salad cuisine) ingredients include: organic greens, organic quinoa, organic rice, and organic chickpeas. The Melt (American cuisine) ingredients include: all natural beef, all natural ketchup, high-fructose corn syrup free drinks, and real aged cheese. Wahoo’s Fish Taco (Brazil/Asian/Mexican cuisine) ingredients include: organic kale, wild caught fish, and all natural chicken. zpizza (Italian cuisine) ingredients include: all natural preservative free pepperoni and meats, organic greens, organic tomato sauce, cheese from grass-fed cows, and non-gmo flour. There are so many additional dining places that aren’t listed here, I suggest doing a quick Google search for local restaurants and cafes that offer organic foods. Even Yelp has organic listings for major cities. And if you’re staying in check out my post about Where to Buy Natural and Organic foods. This entry was posted in Coping with PCOS, PCOS and tagged organic, pcos diet.